The good Aussie red wine that we consumed last night ensured that we slept well. Indeed, we didn’t surface until around 10.00am and we could have stayed in bed longer. However, with the weather forecast showing another hot, clear summer day in Vancouver we organised ourselves and left the hotel around midday. 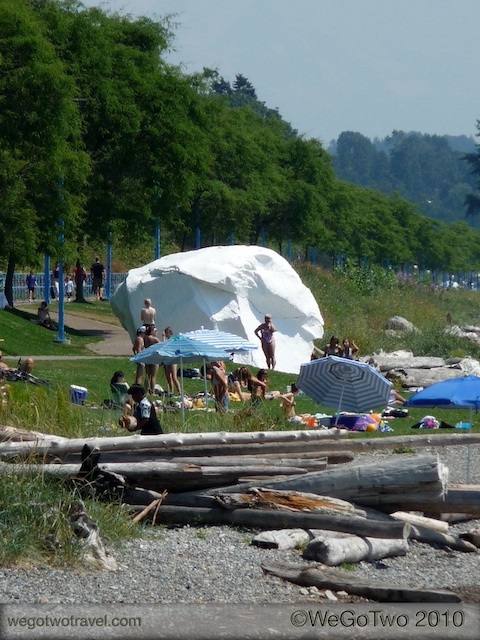 White Rock (the area Gary lives in) is a wonderful town located on the Semiahoo Bay and it is very popular with the Vancouverites – particularly in summer and even more so when it is hot. 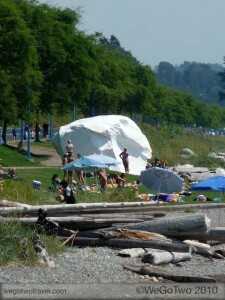 Today White Rock (http://www.whiterockonline.com/) was rather busy. Holiday makers, school holiday kids, and “beautiful people” made up the majority of what was a substantial increase in the local population. After parking the truck we walked along the beachfront before settling on a place for brunch – Tracycakes Bakery Cafe (http://www.tracycakesonline.com/). We ate outdoors un der an awning and soaked up the sunshine. We each had a tasty sandwich and some nice cool drinks and enjoyed the “people watching” opportunities. After lunch we took a short stroll along the pier before returning to the car and taking a drive around the streets of White Rock. The town is home to some very nice real estate and it reminded me a little of where my father and sister live in Australia. Gary was keen to spend some time with us this afternoon so we arrived at his house around 3.00pm and enjoyed some time chatting about his home renovation. We all agreed that he could do with an air-conditioner given the fact that the temperature was hovering close to 33 degrees C.
On a previous visit to Gary’s he treated me to a feed of King Crab (http://www7.taosnet.com/platinum/data/species/crabking.html) and I had raved about it to The Princess and so she was very keen to try some while we were in Vancouver. Gary needed to purchase some crab and other assorted goodies for tonight’s meal so we took a drive to the nearby Superstore – super being an understatement! While Gary and The Princess walked around looking for various items I walked around in amazement. The size of this shop was something to see and I am still amazed at the thought of it. Gary is a bit of a flight simulator fan and he recently purchased some new toys (flat screen monitors and a new control yoke) to improve his simulation. He wanted me to help him out with some flying tips and to configure the new equipment. Gary poured me some very nice red wine and I settled into some flying lessons and computer configuration changes. We had a lot of fun flying a variety of aircraft types and making the new equipment work correctly. After a couple of hours of “flying” Gary and Leah prepared the evening meal (King Crab and salad) and we all sat down to an excellent meal. The Princess’ loved her first King Crab feast and we all agreed that we needed to do it all over again when we were back in Vancouver. With bags to pack and a long trip to Hong Kong ahead of us tomorrow we left Gary and Leah around 10.30pm and returned to the hotel. A hot day by the beach complemented by an excellent seafood meal and some more Aussie red wine. Fantastic. We hope you are making the most of your winter or summer in your part of the world. Life is for living and we hope you are doing just that. This entry was posted on Thursday, April 1st, 2010 at 9:55 am	and is filed under North America. You can follow any responses to this entry through the RSS 2.0 feed. You can leave a response, or trackback from your own site.